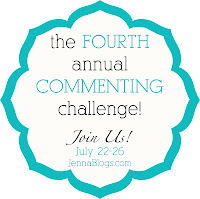 hopping over from Jenna's commenting challenge. So glad to hear you were able to beat cancer! Found my way here from the commenting challenge. Congratulations on beating cancer. That is huge. AND providing childcare. I know that can't be easy! Congratulations on beating cancer! That is an amazing gift! Have a great day! The best gift ever! Thank you! Hi! Visiting from Jenna's. Congrats on beating the cancer- that is awesome! Hi! Stopping in from Jenna's.. I am following you! Congrats on your fight with Cancer! I HATE CANCER!!! Talk to you soon! Hello! stopping by from Jenna's! What a HUGE family you have! How fun! I'm one of 9 kids!! so happy to hear you beat cancer!! I love the chaos of a big family! My dad was one of 12! Stopping by from Jenna's. Way to beat that cancer... you're awesome! Hey! Thanks for stopping by! It's nice to see someone from the Northeast! Any tips on making the transition from working to stay-at-home-mom? 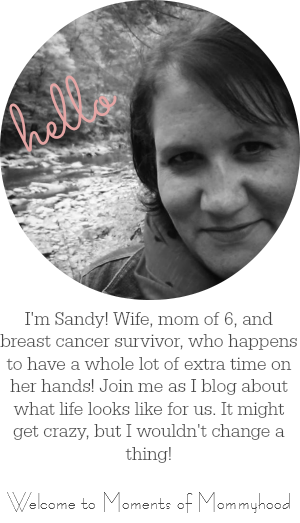 For me, transitioning from my job to being a SAHM was not that difficult. Because I worked in a childcare facility I, for the most part, kept the same schedule. That made it nice for the kids too because they had always been in daycare with me. Keeping a schedule was the key to making my days run smoothly! Congratulations to you on winning your fight! Visiting from Jenna's commenting challenge. Congrats on beating cancer! Yay for beating cancer!! Looking forward to reading your blog. So glad to hear you beat cancer!! I can't wait to look through all of your crafts. I am going to start watching a little girl 4 days a week here soon ( in addition to my own 2 boys that I stay at home with), so I will need all the craft ideas I can get! Stopping by from Jenna's link up! wow! I got the chills reading this! Congrats on beating that awful battle. You are one strong woman! Stopping by from Jennas Journey! Cant wait to read more! Stopping by from Jenna's Journey. We also have a 3 yr old little girl. Congrats on beating cancer! Stopping by from Jenna's. Congrats on beating breast cancer (my mom was really young too when she beat it). Love to read some if your crafts and activities for kids. Looking forward to reading more. Congratulations on beating the breast cancer monster! ^ kids???? WOW! I'm exhausted with just my two!